Balance your diet to eat healthy and get the vitamins and minerals your body needs to make change. Nutrition tips that you would be crazy not to take with you. 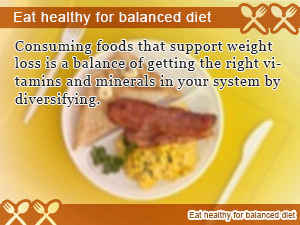 The first step in eating healthy with a balance diet comes from knowing nutrition. That's why in today's Slism, we are going to give you some great nutrition tips to get all the vitamins and minerals your body needs to succeed. There are plenty of foods that are considered good for diet. Are you confident enough and have pulled out the effects of the nutrients they have? Know about the workings of the nutrients as well in order to maximize the effectiveness of your diet. Whether you are on a diet are not your body needs nutrients. Here is a simple break down of the essential nutrients your body can't live without. Proteins made up of amino-acids are required to build basic parts of the body such as muscle tissue making up your muscles and other visceral tissue that becomes your internal organs. When there is a shortage of intake protein in your body, what the body does is decompose muscle protein to compensate for such an insufficiency. When your muscles are decomposed into amino acids used in another part of your body, metabolized by the system, you lose muscle mass which slows down your metabolism. Carbohydrates are used as energy to move the body and fuel the brain. 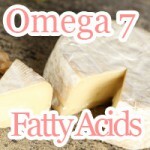 Fats on the other hand, are only used when there is not enough energy from carbohydrates. In a balanced diet eating health there should be no reason that you are not getting enough carbohydrates and fat in your diet. Be careful choosing your diet to make sure you get enough of both. Although you have to worry about putting on fat when you over eat, when you don't get enough carbs in your diet your body begins to decompose body tissue in a process known as gluconeogenesis producing sugar by metabolizing body tissue. In the case of protein your muscles are broken down metabolized into amino acids reducing muscle mass hitting your metabolism hard where it hurts making it more difficult to lose weight. Protein, carbohydrates, and fat play an important role in the body and are considered the only things your body needs to keep functioning, which is why they are called macro-nutrients. The trick to making your diet work getting balanced nutrition is in taking in nutrients that help improve nutrient absorption during digestion by combining a variety of nutrients. Here's a short list of the bare essentials you are going to need to succeed in dieting. Simply put vitamin B2 helps you turn burn fat turning it into energy. Although it isn't hard to get enough vitamin B2 in your diet just by eating the foods you usually do, in order to burn more fat you are going to have to focus on your vitamin B2 consumption. Since what is contained in the vitamin B group is discharged by the outside of the body as urine etc. so getting too vitamin B2 in the same way that fat works is not necessarily bad on the body. There are two types of dietary fiber: soluble in water and insoluble. Soluble dietary fiber is included in many fruits, such as natto. Insoluble dietary fibers are rich in the legumes. Here is how the two type of dietary fiber differ in terms of their effect on your diet to help you eat healthy and balance your diet. Iron is used in conjunction with protein to make hemoglobin that is responsible for carrying oxygen throughout your bloodstream. When iron is insufficient for this purpose, anemia and dizziness, tiredness, symptoms such as headache when I appear ability to carry oxygen is not able to work well. Due to the fact oxygen is used in the fat burning process, when your body becomes less efficient at carrying oxygen causes by an iron deficiency, you diet performance lowers. Although it does not take too much excess iron and have a normal diet, if note symptoms such as nausea or diarrhea may appear because you happen to overdose. It often said that people just don't get enough calcium in their diet. You would know this if you've ever watched milk commercial. Not only does it helps prevent early symptoms of osteoporosis but is also thought to be a cure premenstrual syndrome. Is that true? What we do know is that when your body lacks calcium your bones are broken down to make up for your lack of calcium. This causes your bones to become hollow increasing the chance that you suffer from a fracture or develop osteoporosis. If you can't do it for your diet, do it for your health. Getting enough calcium in your diet is important for maintain healthy bones necessary to live a long and healthy life. There is a nutrient that cannot miss in this way even in the diet. 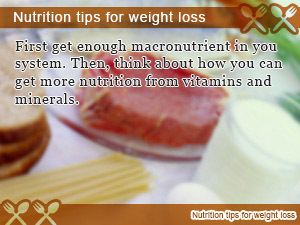 Be careful and aware to try to intake these nutrients whether or not you are dieting. For those of you, who are, make sure you get enough if you want to succeed. Consuming foods that support weight loss is a balance of getting the right vitamins and minerals in your system by diversifying. First get enough macronutrient in you system. Then, think about how you can get more nutrition from vitamins and minerals. 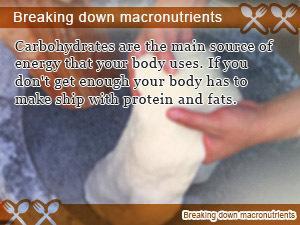 Carbohydrates are the main source of energy that your body uses. If you don't get enough your body has to make ship with protein and fats.